The Ruby Reds have certainly blazed a red hot trail through the month of July! A punting day on the Cam arranged by the Sunny Hunny Belles together with with the Swaffham Sparklers and the Prima Donnas turned into a feast for the paparazzi - general public, Japanese tourists and professional photographers! A picnic on the bank of the River Cam and a tired bunch of ladies finally made it to the train after a long walk back in the sun!! 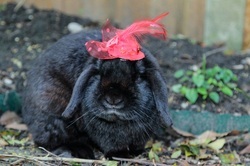 We received an invitation to join the Vermillion Vixens to their day at the Cambridge Botanical Gardens. 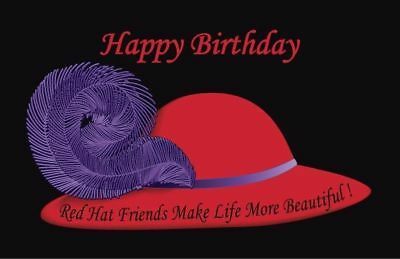 What started up as a small gathering turned into a sea of Red and Purple (60+ ladies ) sitting outside the Cafe doing what Red Hatters do, drinking coffee!! It was a ferociously hot day and ladies were flaking into the nearest seats by the water features. Thank you Hils for all your organising when you were so busy! 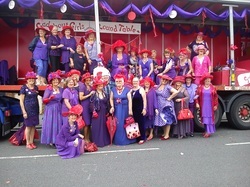 And finally .... Nine Ruby Reds visited the Sandringham Show which was heaving with visitors from all over the country wanting to see Prince Charles and Camilla. We met other chapters at 12 visiting all the flower tents and hat stalls!! The order of the day was a £2 ride on the carousel. Again it was hot but it didn't deter us from perusing the fascinator and jewellery stalls and purchasing more red and purple!! "The winter will ask what we did all summer." 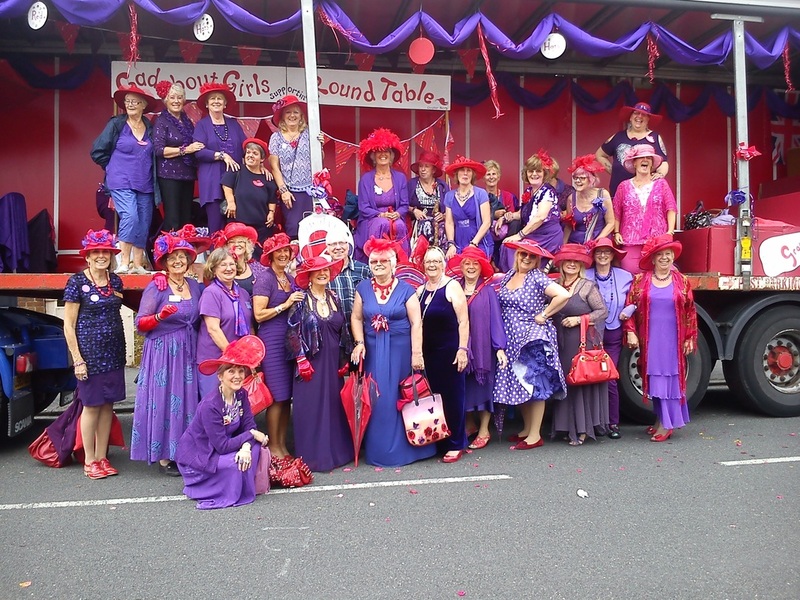 The Gadabout Girls of Wisbech participated in their fourth Annual Rose Fair Parade, "and each year has been better than the last" writes Queen Carol. "I would like to thank my wonderful Gadabout Girls for all of the help getting the float ready and for the constant support that they give me at all times....Great memories..love to all.. Carol"
The Norfolk Broads' pictorial diary begins on the Broads when they all piled on to a paddle steamer at the invite of the Sunny Hunny Belles and cruised up the Norfolk Broads in celebration of their Birthday! Next was the Lord Mayors Procession. 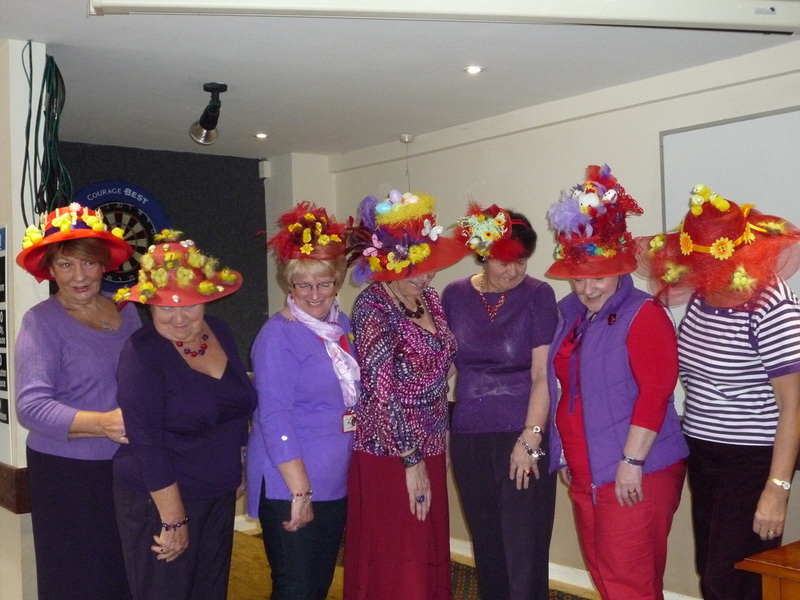 Tsarina Teresa writes: "Looking absolutely fabulous as usual, this year we proudly showed off a Flower Pot of Hats or as one of our members called it, a Hatmobile!!!!! "Ladies Day at Newmarket was unfortunately a complete wash out. We arrived in a Vintage Coach and it looks as if most of the time was spent eating and drinking. Weather wise was an absolute disaster but all our girls, as usual, had fun and made the most of it. 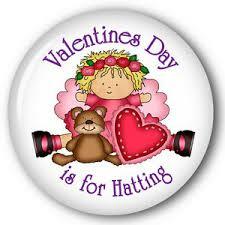 Hatters just smile and Just Wanna Have Fun!!" Despite the morning monsoon, the Sunny Hunny Belles certainly lived up to their name and provided a hatifilarious gathering of Chapters with a Sunshine Cruise on the "Southern Comfort". As usual, a Purple and Red haze settled on the water, and the bar did a roaring trade in Pimms and wine. The live jazz band got our feet tapping and our arms ached from waving at other craft on the river. 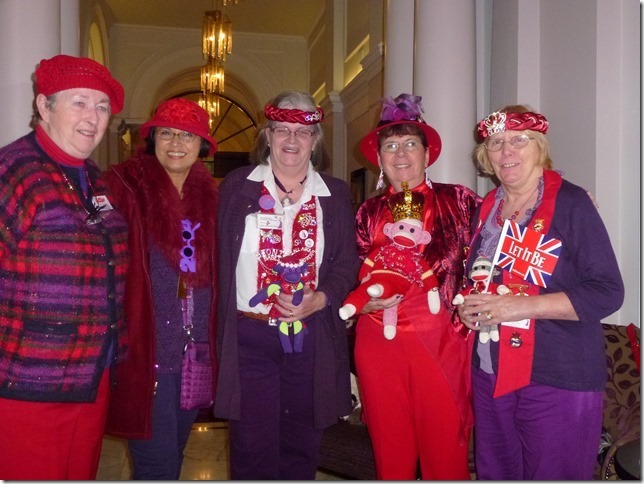 For a taster, these ladies flew the flag for us and did their bit for the Entente Cordiale! ﻿﻿Wh﻿en Yorkshire came to London!﻿ Margaret, Queen Lovely Legs of Ladies 'Aving Fun, Cleckheaton writes: "Tempted as I was to turn up in my Red Hat Queen's regalia I decided that having been invited to a Queen's Garden Party at Buckingham Palace really meant dressing myself 'restrained and in keeping with the other attendees' for a change. That was a hard thing for me to do I can assure you!!!!! Her Majesty held a Garden Party last Thursday 12th June to celebrate 150 years of humanitarian aid by the British Red Cross. I was one of the lucky volunteers who were selected to attend. I have been a volunteer for the Red Cross for 30 years (yes, 'red' has been an important component of my life for nearly half my life). Anyway, I travelled to Shrewsbury on the 11th to stay overnight with a friend and then travel with her and 31 other Red Cross volunteers to London by coach. What a day we had!! Glorious sunshine so we were able to enjoy the Palace Gardens in their full glory. I could not resist taking my shoes off and walking on the grass round the lake (and across the lawn of course). Being me, I found the only bit of mud there was, so ended up with a mucky big toe (that can just be seen on the attached photo) - I may look refined, but you cannot take the little girl and sense of fun out of me. 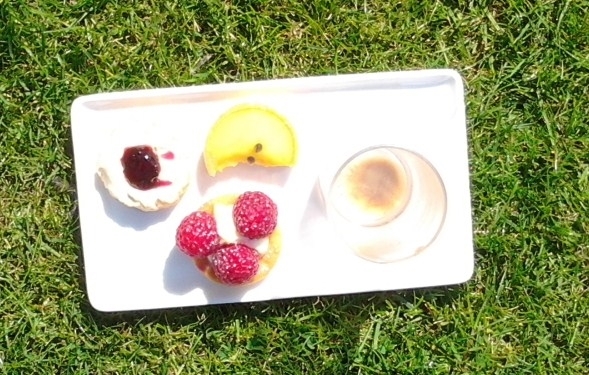 I didn't meet the Royals attending, Prince Charles or Princess Alexandra, but did see the Prince when I was standing munching delicate sarnies (the best being cucumber and mint) and tiny cakes (could have eaten loads of these). You are only given a very small plate to load everything on and the delicious iced coffee takes up a third of the plate. ﻿The Prince had walked through the lines of people lining his route to the Royal Tea Tent and I just caught a sight as he crossed the enclosure to enter the tent to meet up with selected guests. My most vivid memory? Seeing the two old (matching) dressing tables and chairs in the ladies toilet tent - provided for us to refresh our make up or adjust our hat. No one can do Pomp and Ceremony like us Brits!!!!! 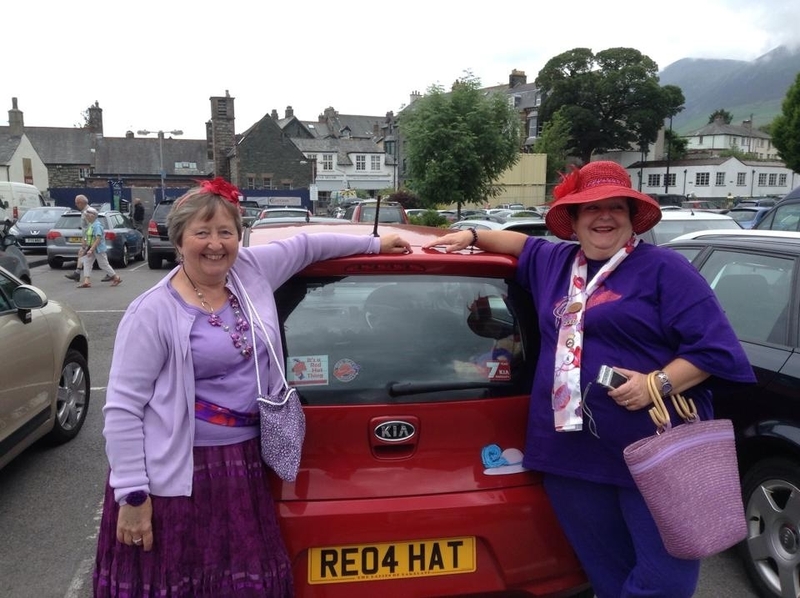 Pauline, Queen Tripalot, shows off her new red car complete with Red Hat number plate. Enjoy your new baby, Pauline and safe travels! 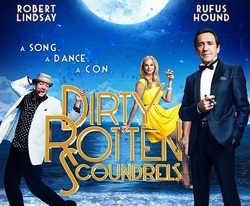 On Thursday 8th May, 78 Red Hatters from several different chapters took up the special "Red Hatters Theatre and Afternoon Tea Offer" and went to see Dirty Rotten Scoundrels at the Savoy Theatre, followed by Afternoon Tea at the Strand Palace Hotel in the heart of London's West End. 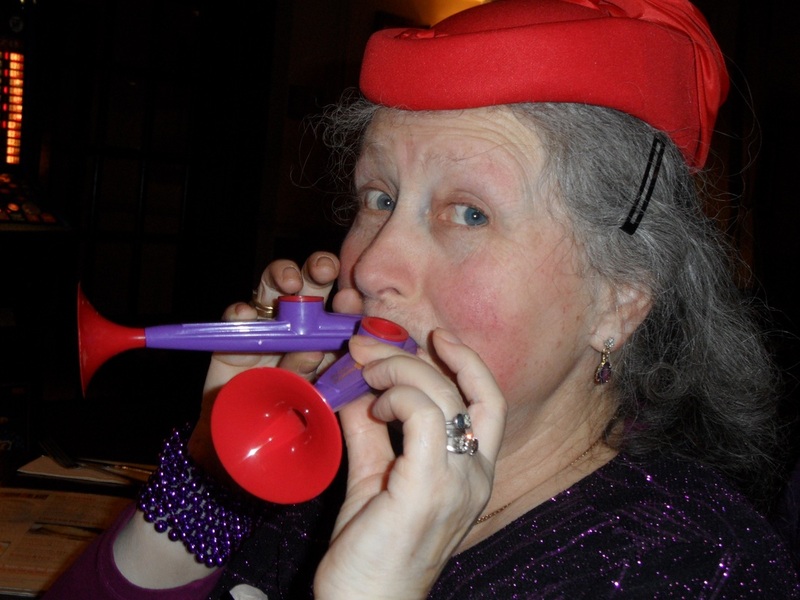 Our friend at the ticket agency arranged with the theatre for the Red Hatters to be able to book in groups of 6, rather than the normal 10, thinking we might have trouble getting the numbers! 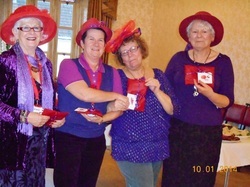 Horsham-based St Leonards Ladies recently went to a silk painting demonstration writes Chapter Queen PeaJay. The demonstrator, Linda, showed us the beautiful things she had made which included an amazing poppy picture. Then she demonstrated how it was done before we had the opportunity to have a go – that was the best bit! You’ll see from the pictures that we didn’t do too badly. We are a very sociable group and were busy chatting about the fun and interesting things we do during a break for tea and cake, when Linda asked if she could join our Chapter! 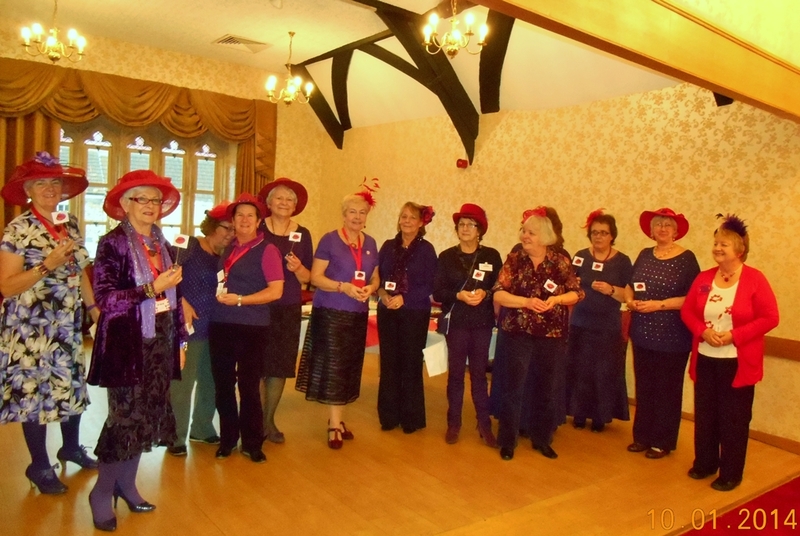 She came along the following week when we had a crochet flower making session to celebrate Red Hat Day. We did have a really enjoyable session but some of the shapes made need a fair amount of imagination to see the flowers - we agreed we need a bit more practice! 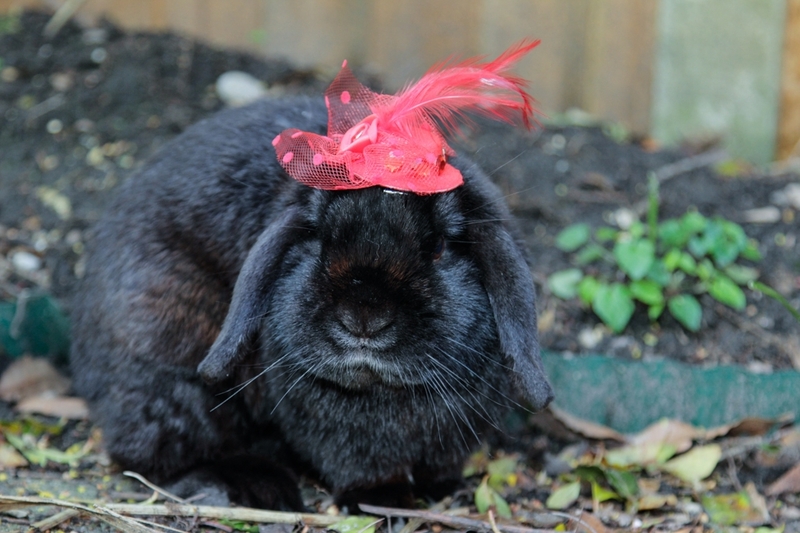 This is Paul - he belongs to Queen Kes of the Pearls of Poole who writes: "We are running a chapter competition of the best photo of an animal (living or a piece of art) in a red hat placed on it by a red hatter. This is my entry – judging will be at the end of the year." We think this is a look which could catch on Kes! 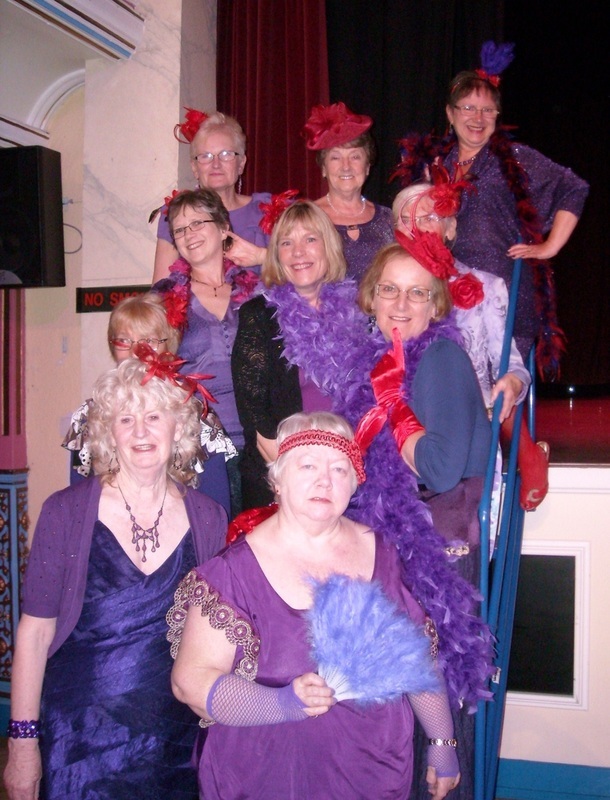 The Cleckheaton Ladies really did 'ave Fun (and dressed to impress) when we went to a Cabaret and Burlesque show at Cleckheaton Town Hall on the 12th April. Our feathers nearly out numbered the feathers on the stage!! A slightly risque (and entertaining) evening was enjoyed by all of us. GYPSY ROSE LEE EAT YA HEART OUT! Thirty-five Queens and Vice Queens representing 20 chapters kicked up their heels at the this year's Gathering of UK Queens hosted by the London Red Hatters' Queen Lorna, who managed to negotiate a super London Theatre Break for us at the swish Canary Wharf Hilton Hotel no less. A great time was had by all at "Mamma Mia" at the Novello Theatre on Friday night. 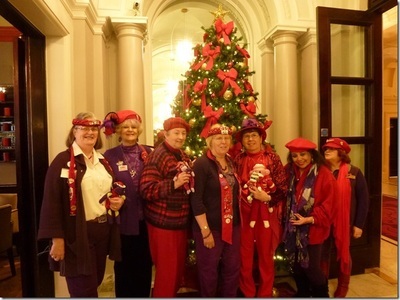 We were joined by the London Red Hatters so were impossible to miss (or ignore)! After an orderly discussion the following morning, we spent the day doing our own thing - shopping, sightseeing, catching up with friends. Saturday night was a 3-course buffet meal especially for us. As it was Earth Hour, the Hilton marked the occasion by having candlelight everywhere, background music from a classical guitarist, AND they served us free vodka cocktails in BIG glasses! We were totally undeterred at the prospect of losing an hour's sleep due to the clocks' going forward for British Summer Time. London, however, is not for the faint-hearted and "my poor feet!" was heard more than once! 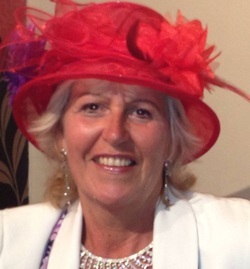 Thank you to Queen Lorna for a fabulous weekend. Joyous Lady Binky of the Crawley Titfer Tats writes: "I thought you would enjoy these pictures. The first is of the group who went to the Isle of Wight, while the others are of the tea party we attended on Monday last. The blurb on the invite went as follows! 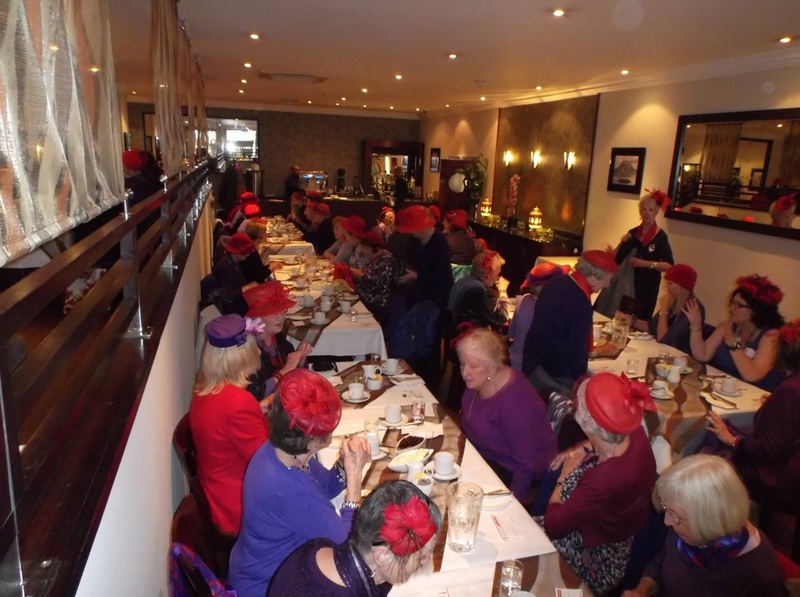 “Ritzy tea and classy cabaret in downtown Crawley, for swanky senior citizens, elegant elders and glamorous golden girls (that would be us then!) Dress code: POSH! The church hall is decorated with flags and bunting, and the crockery is bone china with lovely teapots and serviettes. All very elegant. Everyone dresses to the nines and there is entertainment laid on. Every week is different. We were served with a huge pile of sandwiches and were topped up every so often, then in came the beautiful cakes of all description. At this point I might add the waitresses are dressed appropriately in black with white pinnies. And the waiters are in black DJs with bow ties. (And are a bit gorgeous too!) After we had polished off the food, the entertainment started. This week it was a very talented Greek guitarist to start. After that it was a 3-piece band two of whom had played with the big bands of the swing era (don't know if you have heard of Ken Mackintosh?) They played some good old numbers which a lot of us sung along with. Then the highlight was a wonderful Youth Theatre who are actually appearing at our local Theatre (The Hawth) this week. They are doing “Anything Goes” and performed an excerpt from the show, which brought the house down. We were offered tickets for £5 each which many of us bought, and are going to see the show tonight. Before they played we were given a glass of bubbly to enjoy whilst we watched the show. After all this we sat and chatted with fellow guests, taking photos etc, and then we had to pay our bill, which was the princely sum of £3 per person!!! Yes just £3. As I said, it's Lottery funded for the next 5 years. They close during June July & August as the organisers are also entertainers themselves and are very busy in the summer months. 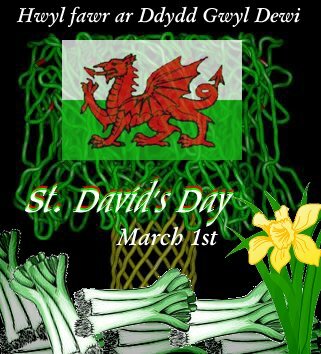 So we have booked for the rest of our group to go in a couple of weeks' time. 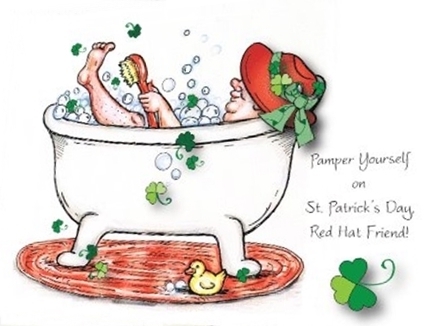 What a grand afternoon, and puts “Tea at the Ritz” into a cocked hat!" 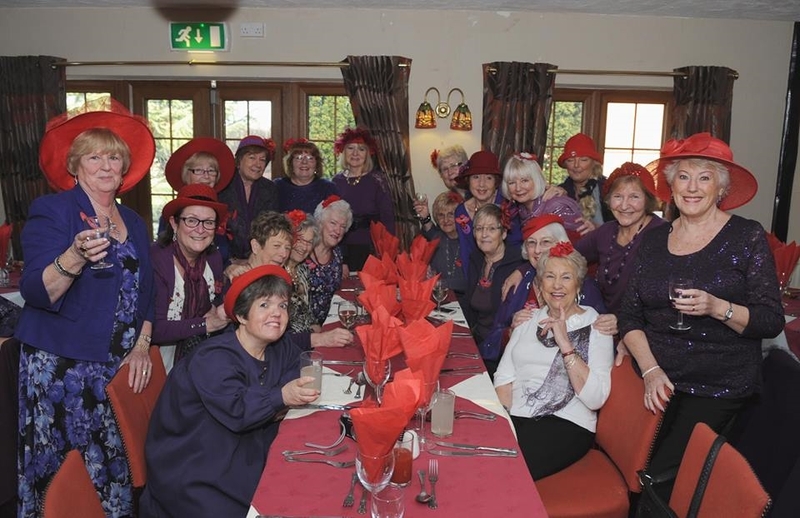 This picture was taken at the March birthday ladies' meal held at Hunstanton Conservative Club, some caught unawares, but all enjoyed the day which was spent visiting the usual charity shops after stuffing ourselves with the usual lunch and wine! So much so that Birthday Girl Lady Manilow had to gracefully retire from the jovialities to catch a bus home and fall asleep for the rest of the day!! On the weekend 14th March through to Monday 17th March 2014, one hundred and sixty Queens & Chapterettes met up on the Isle of Wight for a fantastic weekend of fun and entertainment. 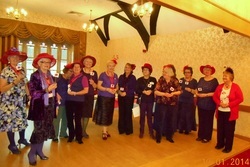 The event was organised by the Vectis Belles who had arranged for us to stay at the Carlton Hotel in Sandown. Upon arrival we were greeted by the Belles and given gifts and an itinerary of events for the weekend. Glitz and Glamour on Friday, tour of the island plus a Masquerade Ball on Saturday evening, tour of the other side of the island plus a Bling, Bling and more Bling party on Sunday evening. The whole event was organised and catered for brilliantly, a great time was had by all. The Isle of Wight was brought to a standstill with our splash of Red and Purple, so many questions, so many cards handed out, we certainly made an impact. What a fantastic weekend by the Vectis Belles. Our many thanks go to Beryl and her team for organising everything. Well Done. This should be sung to the 12 days of Christmas!! let's start a new chapter with just THREE!!!!!!!! A few of the photos taken as we increased our numbers!! 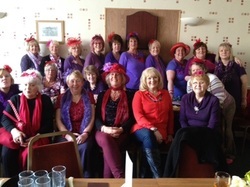 Following the sixth coffee morning we have been visiting many local chapters and at our last interim coffee morning with lunch at the Lattice House we were graced with six chapters in total with 5 visiting us, some Prima Donnas, Swaffham Sparklers, Sunny Hunny Belles, a Sluice Woman and a Fenland Filly!! Four Queens attended and a great time was had by all!! Our lovely ladies have been visiting the Cambridge Razzleberries/Ladybirds and challenging the Prima Donnas to a charity shop race in Cambridge, and the Swaffham Sparklers at Swaffham where we returned the challenge of the Prima Donnas by buying all the red and purple we could see before their bus arrived for coffee at Swaffham!! 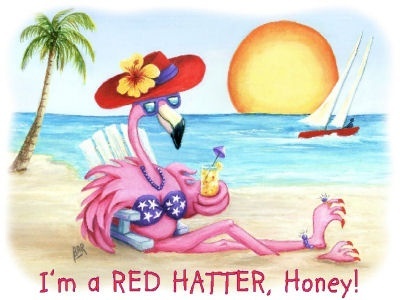 Holidays abroad are being arranged by the new ladies, and they are all thoroughly enjoying themselves to the extent they are asking for more coffee mornings as they are getting red hat withdrawal symptoms!! 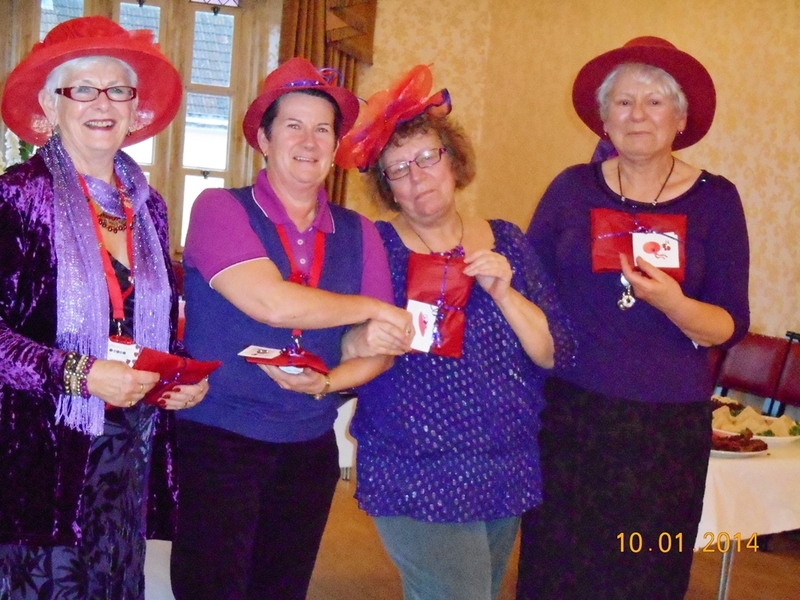 We have Kangaroo Racing in the pipeline with a healthy taster lunch, line dancing and a Jazzboat event to go to, and hope to be doing something special for the Red Hat Society 16th Birthday in April!! Watch this space for more photos soon!! We are looking forward to our our next coffee morning when a representative of Sainsbury's is coming to give us a chat about their Fair Trade Fortnight promotion and supplying us all with a large free hamper full of fair trade products including chocolate and wine!! We cant wait!!! "Well, the one thing that can be said of my Coronation earlier this evening is that we had a wonderful time!!" writes Margaret, newly crowned Queen Lovely Legs of the Ladies 'Aving Fun from Cleckheaton. "It was commented that my 'crown' was a bit of a Carmen Miranda affair (I did go a bit overboard I must admit), but at least Vice Queen Kay's was a bit more restrained. There was a lot of laughter during my 'Pledge' - pity that the best bits were not on video (my friend was laughing so much she kept taking her finger off the button). I think you get the gyst of it from the attached though - it was worth waiting 12 months for!!!!" From 3 original members 1 year ago, we now have 20 members Queen Lovely Legs tells us. Twelve of us managed to get together today to celebrate the 1st birthday of Cleckheaton Ladies 'aving Fun. 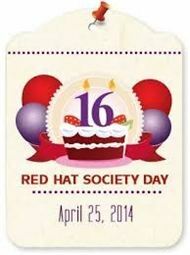 One of our very talented ladies baked a fantastic Red Hat cake for us (delicious it was too). We also shared some of our craft talents. We brought along: photography; counted cross stitch; decoupage; drawings; poetry; hand-made fascinator; and, most intricate of all, examples of Japanese Tamura embroidery (the 'balls' in the photograph). 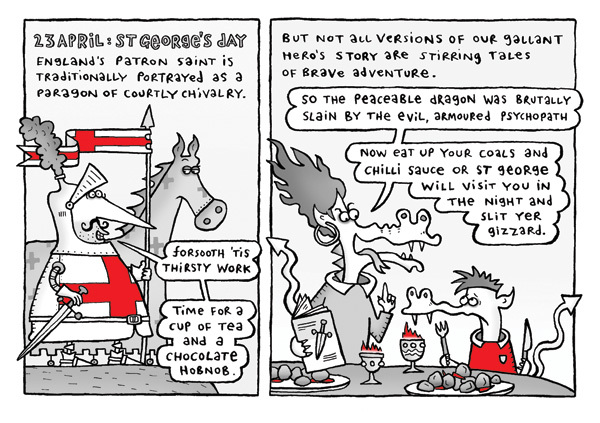 We are looking forward to another 12 months of fun and frolics! 'Cotswold Gems' celebrated their 9th Birthday this month with a delicious Afternoon Tea provided by Duchess of Bredon Jude & Countess Kate of Yate and their team. The venue was the lovely Chipping Sodbury Town Hall and one of the highlights was our own version of the Oscar Awards Ceremony when the hard work and organisation of the 'Gems' was acknowledged. The programme of events during the year is due to the enthusiasm and humour these ladies give to arranging and making them the success they always are. Princess Polly of Beaufort, Dame Katherine of Arrogance, Jude - Duchess of Bredon and Grand Duchess, Plumptious Patricia. 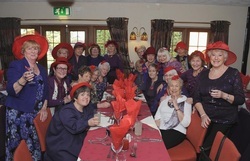 The 50 Shades of Red and Purple Ladies of Kings Lynn and The Sluice Women of Downham Market joined in the ‘Plough Monday Celebrations’ in the Norfolk village of Northwold on 13th January 2014. 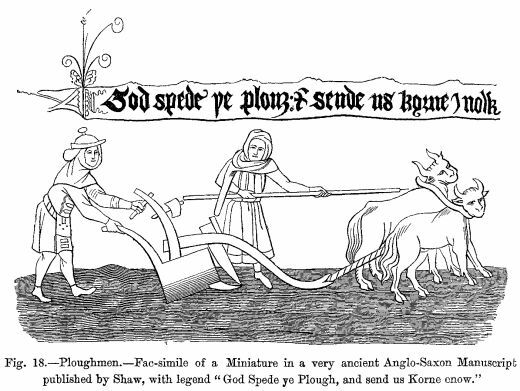 Queen Sharman explained: "The Plough Monday Celebrations" are part of the farming calendar; some say that it was the mid winter feast in some parts of the country before the Victorians invented Christmas. The plough gets blessed by the priest, the dancing starts. 'The Misfit Molly Dancers', were there with blacked faces so that they would not be recognised when they ploughed up their employer’s garden after he refused to pay for the dance. There were 'The Kings Morris Dancers' from Kings Lynn, children dancing with brushes, and many, many more traditional forms of entertainment. The whole thing started and finished in the charming 300 year old Crown Inn. It was a lovely evening." The Norfolk Broads start the New Year with our usual Wassailing event hosted by our delightful Majestic Margaret aided and abetted by her Soxer. The apples are slowly growing on the newly planted trees!!!! The Baroness of Bling heralds the New Year in stereo at the Purple Pearls of Poole January get together. 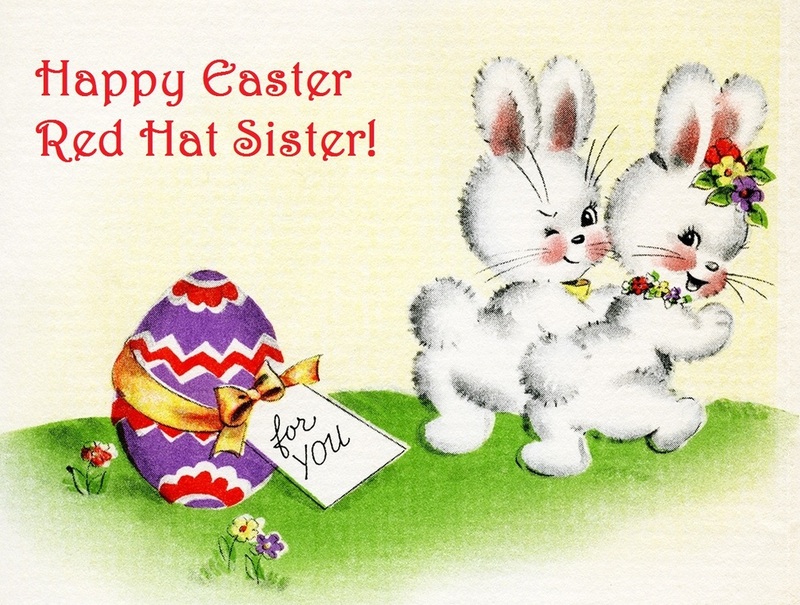 from the Sunny Hunny Belles of Hunstanton, Margaret (Queen Honey Bee) & Vice Queen Princess Sunshine. two Fs lol!! We hope to see you at the Liverpool Convention. Queen Emerald Taffetta of the Debonaires of Weston-super-Mare and Margret, Lady LighthousePearl went to London to meet with some of the ladies that came over for the parade. 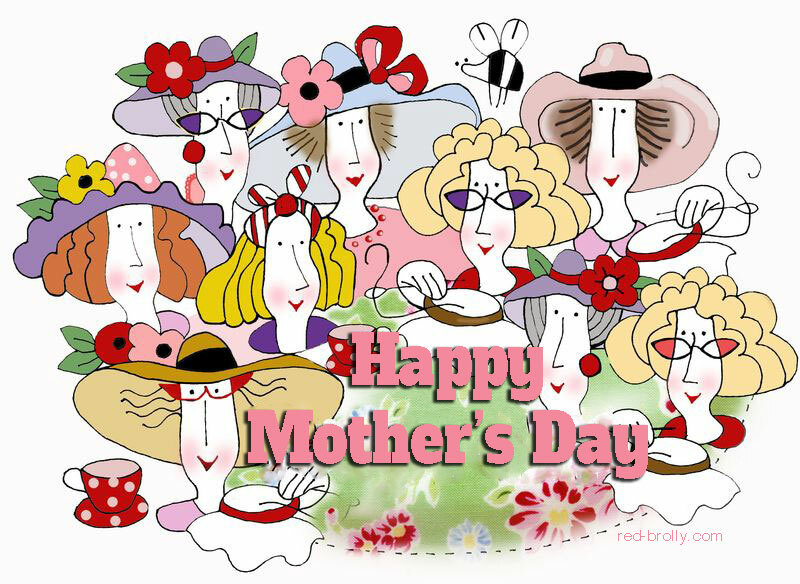 They didn’t take part in the parade, but had great fun the day before with some really nice ladies.